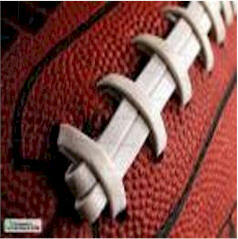 A Cheerleader / Football party is a great birthday theme for twins, siblings or boy / girl parties. These two themes can be combined easily for a fun kid's birthday party that all the children will enjoy. See our video on how to make rooter pom poms for decorations or party favors. Easy to make and inexpensive! Made from $1.00 plastic tablecloths. Set up a concession style booth and serve stadium foods like popcorn, big pretzels, hamburgers, hotdogs, nachos, cotton candy, and peanuts. With a paint pen write party guests names on plastic megaphones and fill with candy. 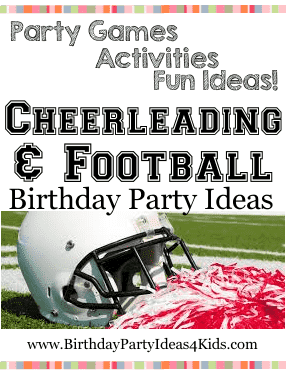 Make or buy party invitations that look like a football and then glue on pompom balls or make Cheerleader poms from 1 1/2" squares of white paper folded several times and then cut the ends into long strips. Buy small plastic footballs and write the party information on the balls with a permanent black marker. Buy or make cards that say "Go Team" on the front in a Varsity style font. Decorate in the kids favorite team colors . Hang up pompoms, megaphones and signs that say "Go Team", ""Defense", "_________ (favorite team) Fans Only! ", etc. Set out footballs on the party table. Make the party table look like a football field by covering it with a green tablecloth and placing white duct tape at each yard line. Decorate the entrance or sidewalk that leads to the party in the same way using plastic green table cloths taped to the ground. Over the front door make a sign that says "_________ (last name of hosts) Field". Use butcher paper to create a run through sign for the front door. Paint it in your favorite teams colors and have it say something like "Go big #9 (for the birthday child's age). Food can be served on the party table in plastic helmets or bowls that are shaped like footballs. You can also set up a concession stand and serve hot dogs, popcorn, nacho's, etc. Have the parents and adult helpers wear black and white referee shirts.